Following the implementation of U.S. import tariffs on solar panels and washing machines, more recent news regarding potential executive branch trade barriers imposed on steel and aluminum imports have caused concern among some American agricultural groups. 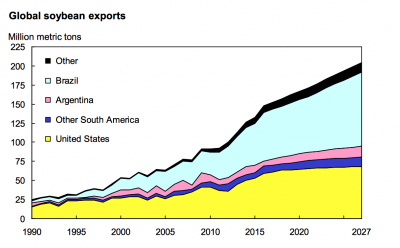 China is a leading producer of solar panels and steel, and is also a key export destination for U.S. agricultural exports. 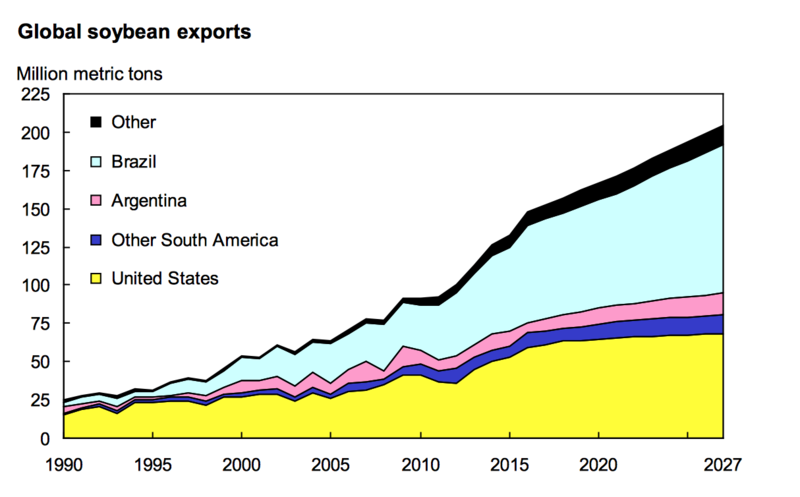 As U.S. farm income potentially languishes for another year, export markets have become increasingly important to the value of U.S. crop production. Some observers have cautioned that agricultural products could be targeted by China in retaliation for additional U.S. trade restrictions. 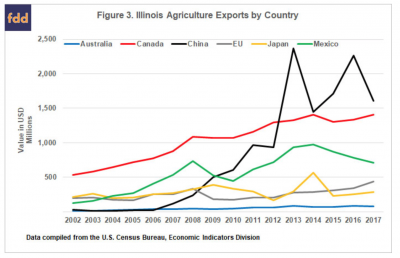 “When it comes to agricultural exports, figure 3 shows that China became the number one export destination for Illinois agriculture in 2013, primarily due to its consumption of US soybeans. 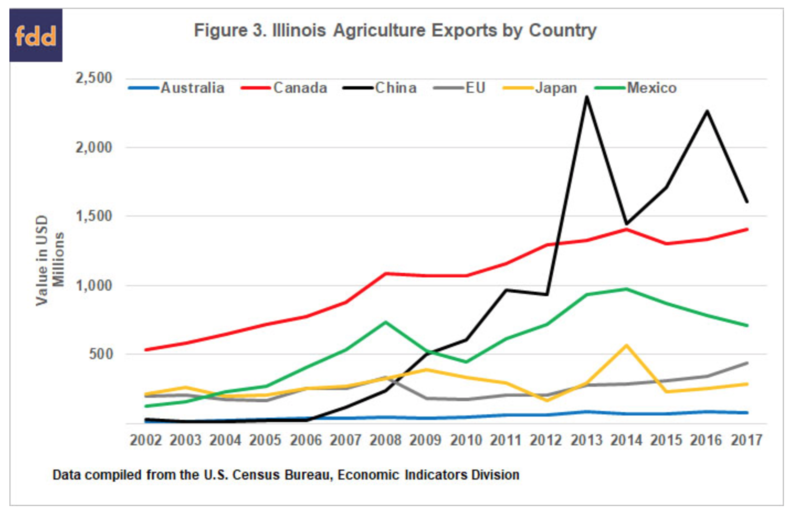 Since 2013, Illinois agriculture exports to China have averaged $1.85 billion per year or an annual market share average of 25% of all Illinois agriculture exports. Again, soybeans are in the lead, with $1.3 billion going to China in 2017 or 63% of all Illinois soybean exports for the year.” Burak, S., K. Baylis, Q. Xie, and J. Coppess. “Illinois Ag Perspectives on Trade Matters.” farmdoc daily (8):20, Department of Agricultural and Consumer Economics, University of Illinois at Urbana-Champaign, February 7, 2018. 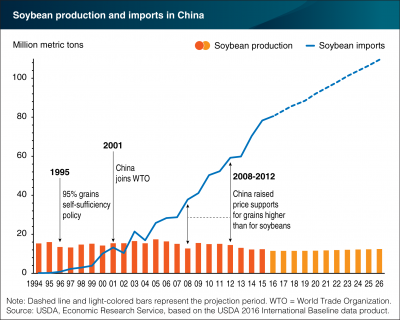 “China is the world’s largest importer of soybeans. The country’s dominance as an importer reflects government policies that favor imports of soybeans over feed grains, coupled with dietary shifts toward more animal proteins, which creates a strong demand for soybean meal used for livestock feed rations.” USDA- Economic Research Service (December 23, 2016). 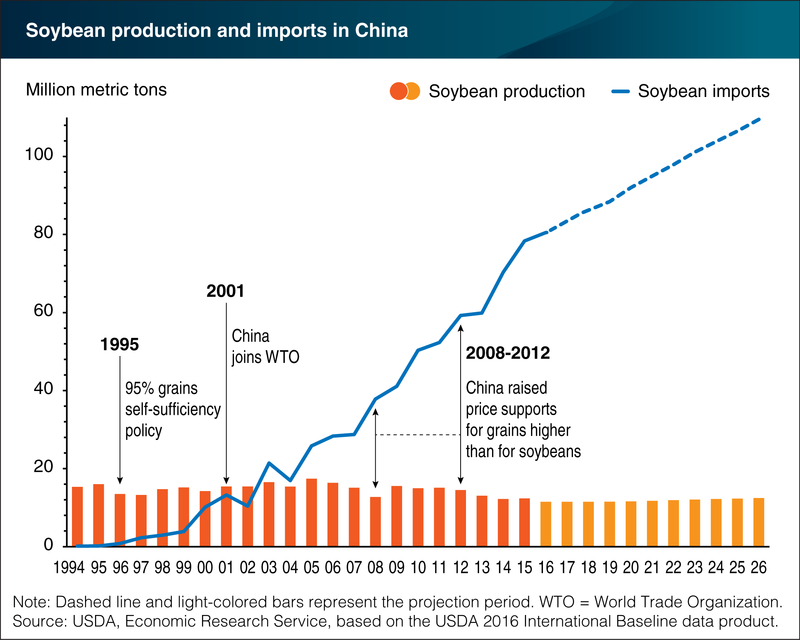 Graph from, “USDA Long-term Projections,” February 2018.
Business news articles continue to highlight how Chinese soybean tariffs are impacting the international sale and purchase of soybeans. Today's update looks briefly at a few of these recent news items.